A riot simulation strategy game. Riot is the debut production from Stimunation, an Italian studio whose lead designer is a former cutscene producer at Valve. The action of Riot takes place in modern times. 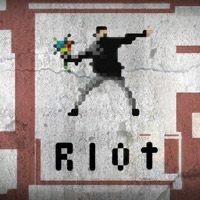 Riot is a riot simulation strategy game for PC and iOS. It is the debut production of an Italian studio called Stimunation. Leonard Mechiari, who had been a cutscene man at Valve, was the lead designer. The developer had actually participated in riots himself and his derives from his experience. The action of Riot is set in the present times. The society is forced to resort to mass rioting because of an economic crisis. The game lets us lead both the protesting crowd and the police. The developers prepared an extensive campaign in which we can take part in the most famous riots of the last few years. Creating the title, the developers didn’t just create an entertaining game. Instead, they based their production on interviews conducted with people who took part in such protests on both sides of the barricade. Thanks to this, Riot, under the pretext of entertainment, lets us learn the truth about riots — what causes them and what the participants feel. The game features a hot-seat multiplayer mode. Virtual protests are shown in attractive pixel-art graphics that brings the visuals of Superbrothers: Sword & Sworcery EP to mind.